Everyone loves snow and Japan is no exception to that rule. Through the cold winter months, these festivals are sure to give you a warm, fuzzy feeling inside. Whether you’re planning to spam Instagram with pics of Sapporo’s Snow Festival, or feeling out in the cold because you can’t make it this year, it’s time to start planning for the next adventure! Sapporo a go? Plan ahead. The most famous snow festival is the Sapporo Snow Festival held on Japan’s northernmost island, Hokkaido. 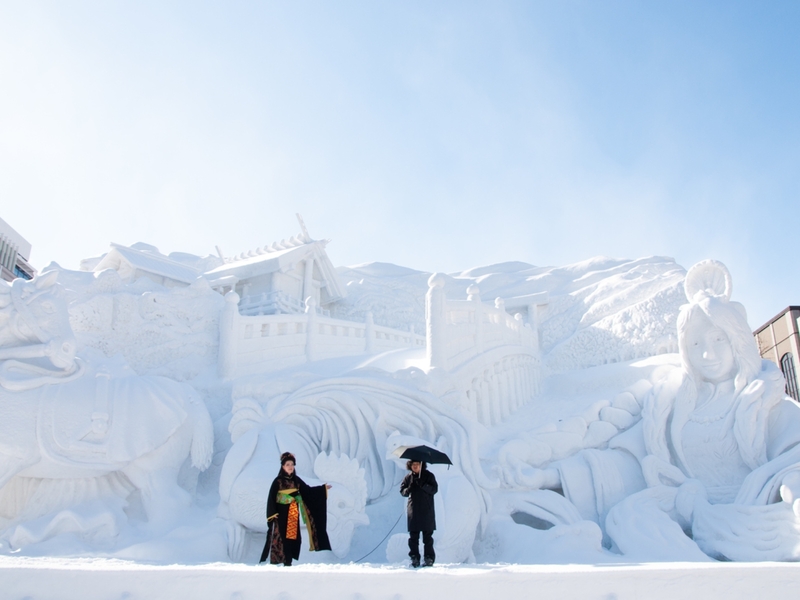 Over two million people make the trek to this winter wonderland every February to get a glimpse of the towering snow sculptures that take over Sapporo’s city center. Ever wondered what a scene straight out of Final Fantasy or Star Wars would look like made entirely out of the white powdery stuff? Well wonder no more — there’s loads to see and do no matter what the time, although these gravity-defying structures look mighty fine all lit up after sunset. For the true Hokkaido experience, make sure to warm yourself up with some soup curry or Genghis Khan (grilled lamb) at the end of the day. Beware that you do need to book accommodation and flights super early for this one (looking at a year to eight months in advance) or expect to pay through the roof for accommodation.